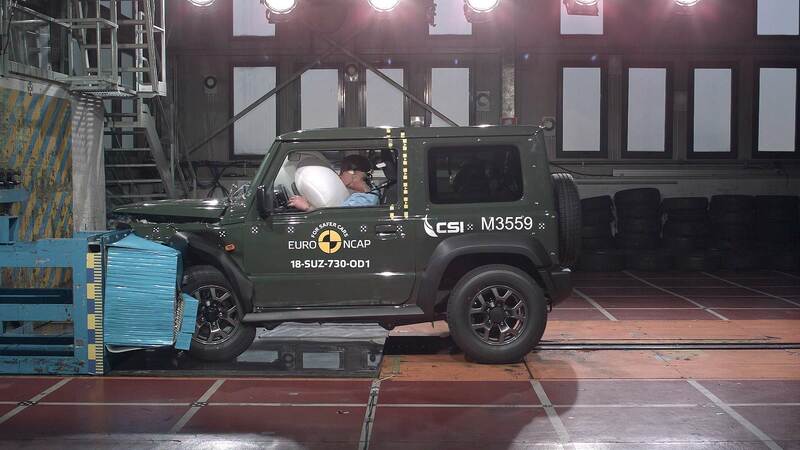 The 4th generation Suzuki Jimny has scored a disappointing 3 stars in the Euro NCAP crash tests. The tested model was equipped with 1.5-litre petrol engine and weighed 1,095 kg. Safety kit included dual front airbags, side head airbag, side chest airbag, side pelvis airbag, seat belt pretensioner, loadlimiter, rear ISOFIX mounts, seat belt reminder, Autonomous Emergency Braking (AEB) systems and Lane Departure Warning. In the Adult Occupant Protection test, the report said that in the frontal offset test, there was insufficient pressure in the driver’s airbag to prevent it from ‘bottoming out’, allowing the head to contact the steering wheel. The score for the head was penalized for the behaviour of the airbag and the displacement of the steering wheel, and protection for this part of the body was rated as marginal. The passenger compartment was extensively deformed in the offset test, especially around the door-frame and the score for the driver’s chest was penalized for this unstable collapse. Combined with marginal dummy readings, protection for this body area was rated as weak. Although dummy readings indicated good protection of the knees and femurs of both driver and passenger, structures in the instrument panel and dashboard were thought to pose a risk of injury to occupants of different sizes, and protection was rated as marginal. In the full-width, rigid-barrier impact, protection of the head of the rear passenger dummy was rated as weak, based on dummy readings during the test, and protection of the chest of both driver and rear passenger was marginal. Tests on the front seats and head restraints showed marginal protection against whiplash injury in a rear impact. A geometric assessment of the rear seats indicated good protection. The standard-fit autonomous emergency braking (AEB) system performed well in tests of its functionality at the low speeds, typical of city driving, at which many whiplash injuries are caused. However, the Jimny did not qualify for these points as Euro NCAP requires good head restraint performance as a pre-requisite for AEB points. As for the child occupant, in the frontal offset test, protection of all critical body areas was good except for the necks of both dummies, protection of which was rated as adequate. In the side barrier test, protection of both dummies was good for all critical parts of the body. The front passenger airbag can be disabled to allow a rearward-facing child restraint to be used in that seating position. Clear information is provided to the driver regarding the status of the airbag and the system was rewarded. All of the restraint types for which the Jimny is designed could be properly installed and accommodated. For vulnerable road users, the report commented that the bonnet provided predominantly good or adequate protection to the head of a struck pedestrian, with poor results recorded at the front of the bonnet and on the stiff windscreen pillars. The bumper provided good protection to pedestrians’ legs but protection of the pelvis was mixed. The AEB system showed weak performance in tests of its pedestrian avoidance in daylight and does not operate in low light. The system cannot react to faster-moving road-users like cyclists, the report added.